Jamie and Simon Vandenberg on their way to victory in the Hellyer Rally. 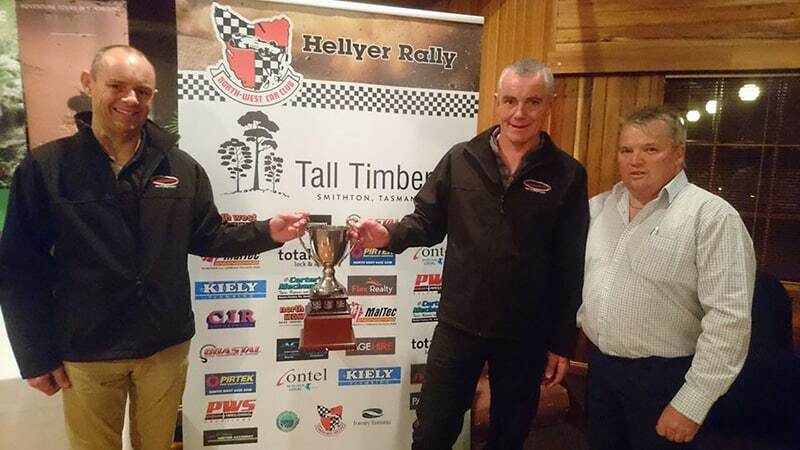 Jamie and Simon Vandenberg have won the second round of the Dunlop-Motul Tasmanian Rally Championship, the Tall Timbers Hellyer Rally. The second oldest, and arguably most experienced crew showed their younger rivals a clean pair of heals in their Mitsubishi Lancer Evo IX as they drove a fast and clean rally to emerge as the victors of the event. In doing so, they also claimed the treasured Victor Huddlestone Memorial Trophy. Tim Auty and Jon Mitchell looked to be certain winners in their Mazda 323 GTR, until it’s dreaded reliability issues again came to the fore. Having created a lead of over half a minute heading into the penultimate stage, the Mazda suffered differential issues which dropped them to thirteenth in the TRC field. The Vandenbergs inherited first place, and stayed there by winning the final three stages, which were regarded as the most slippery of the rally. 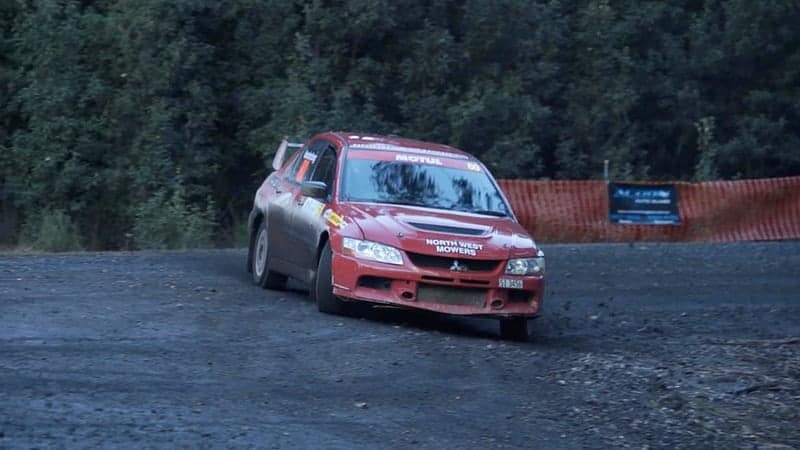 Stephen Maguire and Stuart Benson drove a consistent rally in their Evo 5. The duo stayed out of trouble, and finished every stage in the top five, netting them second overall for the weekend. Bodie Reading and Alex Malcolm took the lead after the first two stages, but was overhauled in stage three by Auty. The next two stages saw an excursion through a farmer’s fence and into a field on the penultimate corner on stage four which cost time, whilst an altercation with a tree in stage five further cruelled his chances. They were able to hold on for third with a second hand looking WRX. Kurt Wylie and Elli Wilson did well to hold onto fourth outright, with their Subaru struggling with an intermittent cut out during the day. 2016 champions Keith Abblitt and Adrian Hodgetts had to withdraw from the debut of their new Evo 8 due to centre-differential issues and co-driver illness. In the Buckby Subaru Challenge it was expected that Nic Grave and Ben Newman would continue their battle with Grave winning the first stage and Newman hitting back to claim the second. However, the rest of the field had other ideas. Targa podium getter Michael Pritchard and Adam Butler had a large impact to the rear on stage one, but continued on, winning three stages to secure second for the event. ​Crichton Lewis and Anthony Carr also performed strongly to secure a stage win and finish third overall. Bill Fulton and Jason Milner showed impressive pace before an off road excursion saw them fall out of contention but the cruelest blow was for Newman. After winning heat 1 by 1.2 seconds, Newman and co-driver Steve Glenney crashed and became stuck on stage five, which handed Grave and co-driver Reubecca Sheldrick the win and fifth outright. In the two wheel drive category, a close contest was anticipated between championship leaders Stephen Turner and Mitch Newton in a Ford Fiesta R2, and local team Kade Barrett and David Guest in their Plymouth Fire Arrow. Barrett won the first stage in convincing fashion before he lost four minutes with throttle issues on stage two. It was expected that Turner would overtake the stricken Fire Arrow on the stage, however he became bogged on the side of the road before reaching Barrett. He lost 40 minutes and any chance of outright victory. This left the Datsun 1600 of Mark Kyle and the Daihatsu Charade of Aidan Peterson to battle it out for the first heat, with Kyle the victor by six seconds. However, the drive of the day belonged to Barrett. Chasing hard, he made up over three minutes to finish third in Heat 1. In Heat 2, Barrett set a string of top five stage times, including a second fastest, to elevate him to sixth outright for the event and third in Heat 2. Kyle and Peterson continued their close duel, with Kyle beating Peterson by 14 seconds to be second two wheel drive home. In the fight for the Dunlop-Motul Tasmanian Rally Championship, Bodie Reading and Alex Malcolm extended their overall advantage, with Nic Grave, Ben Newman and Stephen Turner fighting for second place. 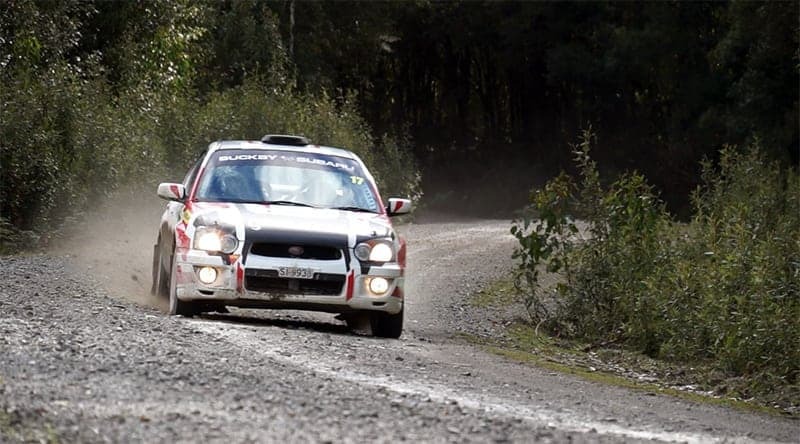 The championship moves to Launceston on the 27th-29th of July for Subaru Rally Tasmania and the return of the CAMS Australian Rally Championship to the state of Tasmania.